It’s a fact that the death rate amongst golfers is 40% lower than non-golfers. Also, the lower your handicap the longer you live – It’s been proven by scientists in Sweden who looked at the health & longevity of 300,000 golfers. What better incentive to start playing this wonderful game. It’s unique combination of outdoor exercise and social interaction can help you lead a happier and healthier life. It can significantly lower the risk of developing dementia, especially vascular dementia as it encourages blood flow and oxygen to stimulate the brain. We are just about to launch our “Golf Days Out” pilot in Lincoln. 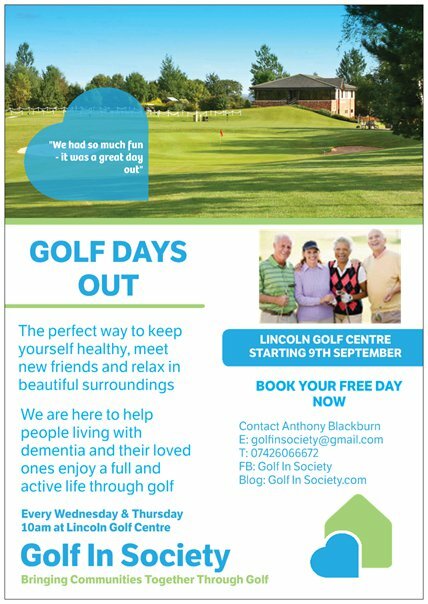 Our aim is to encourage people living with Dementia and their loved ones to consider golf as their preferred leisure activity – leading to a longer, happier and healthier life. It starts next week and you can follow our progress on this page and facebook.